We don’t look alike. We don’t eat alike. We don’t always dress alike. But we all do have at least one thing in common. Without it, there would be no PRs, no first marathons, and no run streaks. We wouldn’t get up and run in the heat. Or the cold. Or when we are tired. We might run from time to time when we are bored, but it would be short and meaningless. Like anything else, each runner finds inspiration in a different form. Whether it’s completing a goal that once seemed unreachable or maybe just running with others that get you going, embracing that inspiration is key. I’m often asked how I can run for 3, 4, 5 hours at a time and not want to quit. “Don’t you get bored?” I often hear. My response is usually a polite chuckle with some answer I think will give them satisfaction. Because the truth is that if they can’t fathom why I’d run for that long, they’d never understand what really inspires me. Don’t get me wrong, I do love to run, but I’m not out running 5 hours through the city streets every day. It’d drive me crazy. But I absolutely love running through pine lined singletrack, or along a beautiful creek bed deep in the woods. And one of the only things that inspires me to get out every day and run through crowded, noisy streets is the fact that I know I couldn’t spend 5 hours in the woods if I never trained during the week. Anton Krupicka is a man who has built his entire life around his inspiration. For him, it isn’t just a run every few weeks that keeps him coming back, but the near daily summits of some of Colorado’s highest and most exciting mountains. 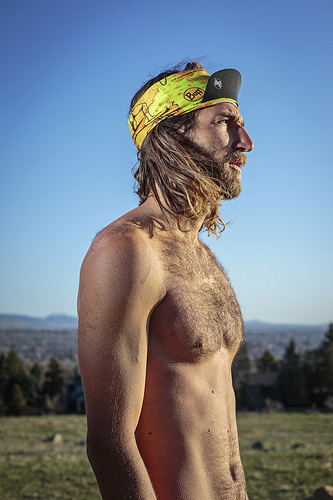 Anton is that long haired, super tan, free spirited ultrarunner many of us dream of becoming. He will live out of his car for months at a time, traveling from one trail head to the next, each day taking on some new epic quest. He won the Leadville 100 twice, placed second and beat the course record at the Western States 100 miler, and has dominated countless other 100s and 50s. His minimalist lifestyle and connection to the mountains has made him a star. But for me, it’s his personal inspiration that is so captivating. And that inspiration is highlighted in the new film In The High Country by Joel Wolpert with support from Ultimate Direction. I sat down with the future Mrs. RCR and a good friend Tom to view the film which I’d been waiting months to see. Mrs. RCR and Tom aren’t runners themselves, and knew very little about Anton, but the trailer was appealing enough that they agreed to watch the 35 minute flick. After a few minutes of credits, which were accompanied by beautiful shots of the Rockies and Anton running up and down those Rockies, the film jumps right into the first of 5 chapters. It starts with “Roots,” where we learn a bit about Anton’s upbringing and how he started to fall in love with running and nature. We hear interviews from Anton’s father and listen to Anton himself speak about exploring the trails and roads of Nebraska. “The Practice” and “Chasing Muses” round out the two final chapters of the film and dive in a little deeper into the daily life of a professional ultrarunner, and why he sees significance in what he does. The camera focuses on black toenails and acupuncture needles, as Anton continues to describe this notion that how our landscape defines us, and the more we know it, the more we become it. In The High Country is a film about a lifestyle driven by one’s surroundings and constant need to grow more and more in tune with what it offers. A film about finding inspiration and diving in head first. After the film was done I turned to Mrs. RCR and Tom to see what they thought. We all admired the beautiful artistic filming, Anton’s lifestyle, and the theme of connecting with what inspires us. But it became clear that the lack of background and story in the film leaves those who don’t know of Anton feeling a little left out. While I admired the man more than ever, Tom sat confused about who Anton was. Mrs. RCR, on the other hand, who had heard me go on and on about the guy, gained a better understanding of what draws me to his lifestyle. The movie is stunningly filmed and full of mountain running shots that is bound to get any runner’s mojo bumping, so it’ll come as no surprise that if you’re an Anton Krupicka fan, picking up a copy of In The High Country is a must. If you aren’t a fan (yet), then I recommend you become one, then pick up a copy of the film. Right now it’s going for $15 on vimeo or can be seen at screenings worldwide. Now if you’ll excuse me, I have to attend to my bumping mojo.